We've mentioned the Raspberry Pi before, a budget micro-computer that's gone through multiple iterations - its low price (typically $50 or under) means it's a wonderful educational tool or, alternatively, a side-project for enthusiasts. The Game Boy Zero is an example of the latter. As the name suggests this is a Game Boy fitted with a Raspberry Pi Zero board - pictured below, it's the work of a certain 'wermy'. 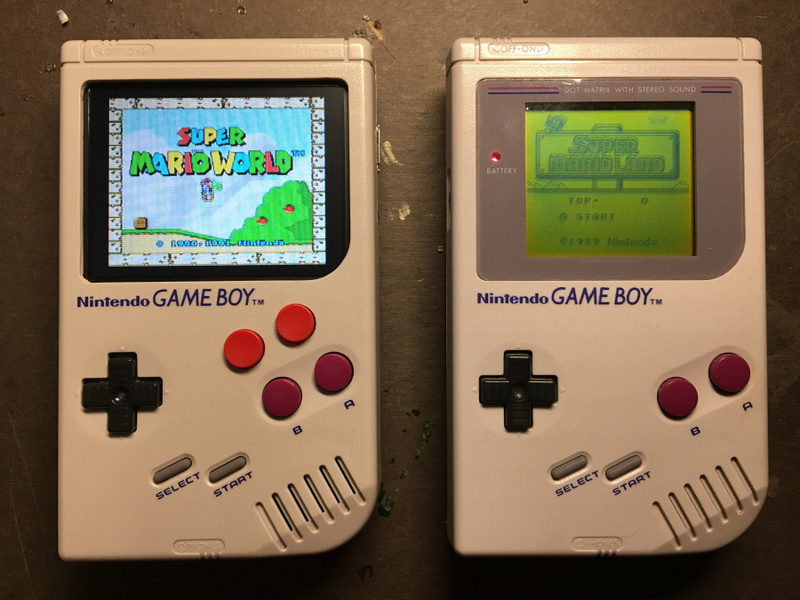 Wermy has taken a Game Boy and added a new colour screen, and then heavily customised the Pi to operate within the casing. Two additional face buttons (from a NES controller) have been added, in addition to neat buttons on the back that work as Z and L.
The purpose of this is to run a Raspberry Pi-based emulator - with the inevitable grey areas that entails - through the system, but the neat touch is that Wermy has also created a Game Boy cartridge that's home to his micro-SD card; the whole thing is designed so that the cartridge goes in the original slot for that classic feel. Naturally the emulator plays an array of retro games - let's be generous and assume Wermy is downloading games he owns. Although I am never fully convinced by those L and R button placements, I agree this is a thing of beauty. The Future: We live in it. Give that man a medal or something! "buttons on the back that work as Z and L."
I have a RasPi lying around. I wonder how hard this is, it sounds like a fun project. @Snargledon I'd imagine it uses the Retro Pie image, which basically turns the Pi into a multi console emulator. I've got mine setup with that and was really considering putting it in a Gameboy but couldn't work out how everything would fit into the case. I've just got it hooked up with a clone SNES controller and a wireless one too. @Shiryu They're actually pretty usable. Not as nice as an SNES controller for sure, but they do the trick! @wermy Id probably get used to them in time. Congrats on such an awesome project. Do you sell any of these? @Shiryu Thanks! Not at the moment. I've had literally hundreds of people ask that. The other question people ask is if I can do a more in-depth tutorial, which I'm working on. @wermy Excellent. Thank you for your efforts on this, it is absolutely irresistible for people like me. @wermy If you ever plan on selling any of these let me know. I'd throw a couple hundred bucks your way! That is one of the best things I have ever seen, well done that man! Really nice job though - love the SD card in a cartridge detail! edit: Yep, model zero right at the start of the video. That is absolutely the best raspi in a Gameboy I've ever seen. Stunning. I love when ppl do things like this, very impressive, very cool! Oh look someone doing something that supposedly Nintendo can't do. @Tasuki Why would Nintendo want to case mod a Raspberry Pi? That is really cool. It is amazing how creative people can be. Playing that in public must turn some heads! A lower cost handheld that plays all sorts of virtual console games would be awesome. Toss in a web browser and mp3/mp4 play back just for fun. Sounds like a PSP running on custom firmware. That's very cool. I'm tempted to get a Raspberry Pi at some point, since it looks very fun to mess around with it trying out various things. Would be great if Nintendo can release a New 2DS MICRO in the future to do just that. Bring back the hinge just to keep it small, but get rid of 3D to keep it cheap. 3DS and New 3DS hardware has always been ancient, but once they release their next handheld perhaps Nintendo will finally be able to drop some of their desperation and make a budget New 2DS with a sensible price (one could say the 2DS was overpriced at launch considering how often retailers had to put the thing on sale just to clear stock). @Tasuki The Raspberry Pi CPU is actually more powerful than the O3DS CPU, even for the model zero. Keep in mind that the model zero Pi costs a whopping $5...! The model 2/B Pi only widens the gap, for an extra $40. Rather than highlighting incompetence, this moreso just highlights how overpriced using a N3DS for emulation is- an abysmal price performance ratio. @toxibunny Not bad! With a model 2/B Pi, though, it could handle Donkey Kong Country 1/2/3, Mega Man X2/3, or Yoshi's Island just fine. The New Nintendo 3DS is good, but every 3DS iteration has the same weak point: the screen, they all are low quality displays compared to any smartphone... or Vita. @BarryDunne But the past is already behind us, even as I type this. I always wanted to do something along these lines, actually. I do not want to use a working system because of this project, though. Me, my preference would be a Raspberry Pi 3 (85.0 mm x 56.0 mm x 17mm) inside a (broken) Sega Nomad (108 mm x 190 mm x 51 mm). After all, I prefer that 6-button control when playing Sega Genesis games. I'm throwing money at the screen, but nothing is happening. Really cool. Love the SD as a cartridge feature. Really seals the deal. Sweet JESUS, this has just moved to the top of my Christmas list!